To put it simply Tom Morello is awesome. Here’s why: Mr. Morello, the Grammy award winning guitar player, songwriter and singer has been with Rage (yes I abbreviate in deep hopes to connect with my inner youth), Audioslave (no abbreviation necessary) and the Street Sweeper Special (no urge to abbreviate). 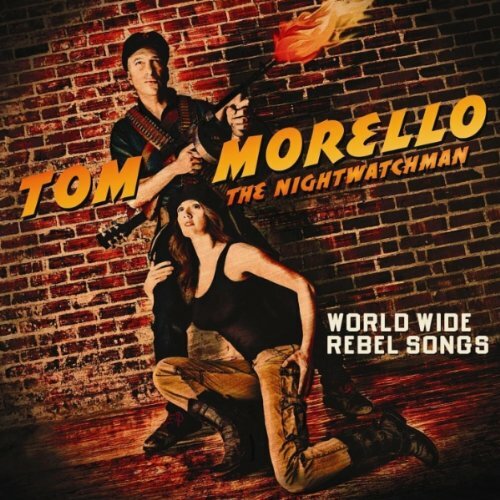 His solo work is otherwise known as the Nightwatchmen with specific reference made on World Wide Rebel Songs. Morello’s activist roots are omni-present throughout the album. Each song is more brave than the last while remaining completely non pretentious and charmingly hammy. The opening tune – Black Spartacus Attack Machine (again no urge to abbreviate, this may be the best title of all time) is an open entrance into a song that leads down the fist bumping, beer spilling head nodding opus of a record. The track is inclusive and angry with purpose and creates a theme for Morello’s radical rampage. This is followed by the haunting “Dogs of Tijuana” which brings me back to exactly how I felt in the midst dusty mayhem of the urban wasteland. The guitar playing is phenomenal and remains this way throughout the activated soundtrack of conscious anger. Although almost each song involves some sense of excessiveness, it works, and usually doesn’t in other cases. I believe Morello gets away with the shiny guitar solos, back up choirs and repetitive lyric throw downs because each are well done. The guitar is played extremely well, the choirs are epic in congruence to his message and his lyrics and intelligent. Morello touches on diverse subjects which intertangle quite nicely involving whiskey, heartache, the wayward planet in which we live and the power of being bold. All of which involve an overlying sense of hope and unapologetic joy. This is the root of true democracy and the proper segway to anarchy. The backs up singers really drive it home. I feel the volume of the album is crucial and shall be listened to standing up. After that walk forth and be brave.